This plaque and one showing St Paul disputing with the Greeks and Jews (223-1874) almost certainly came from the same object, possibly a large altarpiece or reliquary casket. 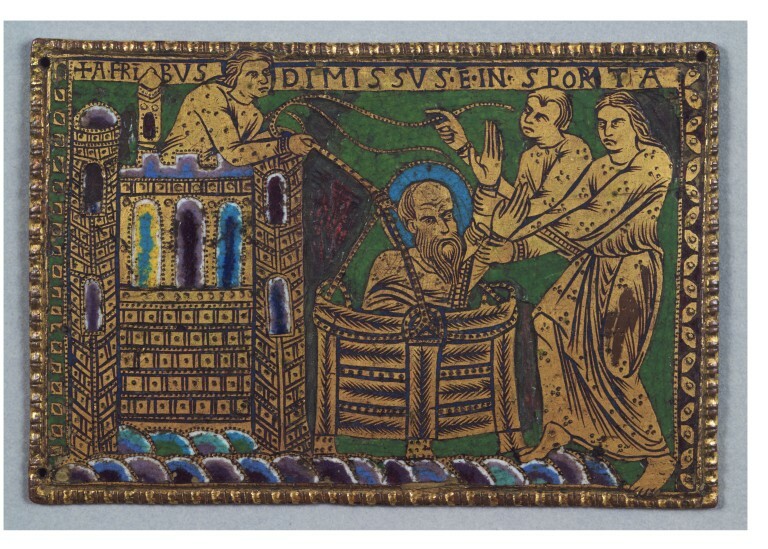 The episode depicted here (St Paul being let down in a basket from the walls of Damascus) immediately preceded his philosophical dispute. Five other plaques from the same series survive in various other museums. The choice of scenes reflects the iconography of Siculo-Byzantine mosaic cycles in Sicily, probably transmitted to England via contemporary manuscripts. The plaques are thought to be English because of their particularly close links to English manuscript illumination. Links to wall paintings in St Gabriel's chapel, Canterbury Cathedral have also been pointed out. Rectangular copper-gilt plaque in landscape format with champlevé enamel. The background is blue enamel, with the main figures reserved in gilt with engraved details. Along the top edge of the plaque is the inscription, engraved on a reserved and gilded background: + A.FR(atr)IBVS DIMISSVS.E(st)IN.SPORTA (Acts IX.25: “He is let down by the disciples in a basket”). To the left of the panel is a castle with two frontal towers, and one towards the back. It has three central windows, highlighted with blue and purple enamel, while the two front towers each have two further lancet windows, in purple enamel. The bricks are engraved on the reserved and gilded background. A male figure (a disciple) stands on the roof of the castle holding the rope from which the basket, containing St Paul, is suspended. The bearded and saint is depicted half-length within the basket, with his arms raised towards his left, towards two standing male figures (two further disciples). His halo is blue enamel, and the basket is gilded with details in dark blue enamel. Along the bottom edge is a border decoration which reaches almost to the right hand edge, in blue and purple enamel. Along the left edge is a green and gilded border, and along the right edge is a different decorated border, where the enamel has been lost, but the gilding remains. There is punched decoration on the castle, and the clothes of all the figures, as well as the lower enamelled border and the basket and ropes. The outer edge of the panel has a beaded border. At two points the design on the plaque stretches out onto this border: the head of the man on the castle, and the left foot of the right-hand standing disciple. The reverse of the panel is flat and plain with a few scratches. There are pin holes in each corner, and eleven holes along the left-hand side, possibly original. There is damage between the right-hand wall of the castle and the rope supporting the basket. "He is let down by the disciples in a basket". Acquired in 1926 with the aid of a contribution from Mrs H P Mitchell in memory of her husband, formerly Keeper of the Department of Metalwork. Previously in the J. E. Taylor Collection, sold in the sale of the collection at Christie's, 1.7.1912, lot 62. 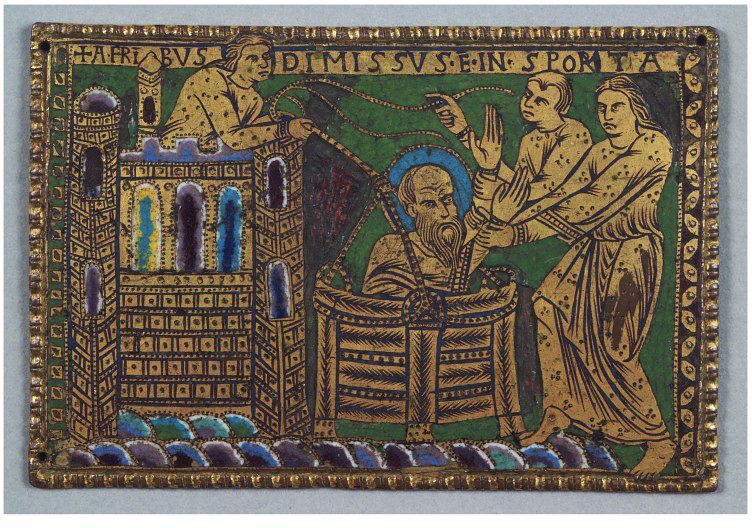 Historical significance: The choice of scenes in this group of plaques reflects the iconography of Siculo-Byzantine mosaic cycles in Sicily (cf scenes of St Paul being lowered in a basket and disputing with the philosophers appear at both Monreale and the Capella Palatina, Palermo). These are suggested as a model by Gauthier 1972. Both the V&A scenes (M.312-1926 and 223-1874) also appear in a Bible, in the Monastery of S. Paolo fuori le mura, f.307v (illustrated in H. Buchthal, 'Some Representations from the Life of St Paul in Byzantine and Carolingian art', Tortulae: Studien zu Altchristlichen und Byzantinischen Monumenten, Rome, 1966, pl.12. Buchthal suggests (p.48) that the scenes' appearance in this manuscript (an enlargement and improvement on previous illustrations depicting the story of St Paul and dated to around 870) implies a source in a lost Byzantine illustration to the Acts of the Apostles. 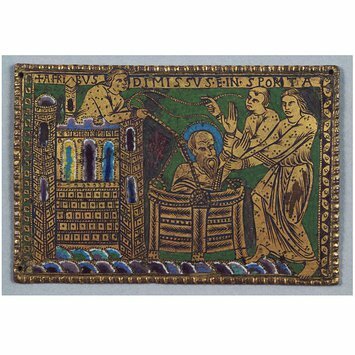 This plaque and one showing St Paul disputing with the Greeks and Jews (223-1874) almost certainly came from the same object, possibly a large altarpiece or reliquary casket. The episode depicted here (St Paul escaping from Damascus) immediately preceded his dispute, shown on 223-1874. Catalogue of the Renowned Collection of Works of Art chiefly of the Medieval and Renaissance Times, Greek and Roman Antiquities, French 18th Century Furniture and Old Chinese Porcelain formed by the late John Edward Taylor Esq. of 20 Kensington Palace Gardens, W., Christie's, July 1st, 1912, lot 62, plate facing p.44.